You know those brass-and-glass sconces that always wind up in apartments? The ones with a cluster of grapes etched into the frosted, fluted shade? Like these. Gross, right? Well, there are four of those suckers in our apartment. FOUR! You can see two of them in this photo. Not wanting to get too spendy with hardwired light fixtures in a rental (but being completely unable to live with the sconces as-is), I did a little brainstorming and came up with a solution. I removed the shades and put them in storage (we’ll put them back when we move out), then spray-painted the brass glossy white. Happily, they came out looking like porcelain—very much like the ceiling fixture in our bedroom at the house. Rather than mess around with shades, I ordered four silver-tipped round glass bulbs and called it a day. Not bad for a total investment of less than $20! And before anyone asks, NO, I don’t feel badly about painting the sconces. They were grimy and had multicolored spatters on them from years of sloppy paint jobs. They look a million times better now. As I’ve said before, the day I encounter a landlord who puts care into their own renovations and maintenance work is the day that I start caring about whether or not I’m “allowed” to make my own real improvements to the space I’m paying to live in. Great! you are not afraid of painting anything! Since I met your blog I’m painting everything that I don’t like around me and it really works!! I have those same, exact sconces in my new living room…4 of them that I HATE. Two of them are staying, two are coming down and will be covered with plates then painted to match the wall. Now I have an idea of what to do with the 2 that are staying! I feel the same way about fixing up a rental…I always leave it better looking than when I arrived, and I have never had a landlord complain…yet. 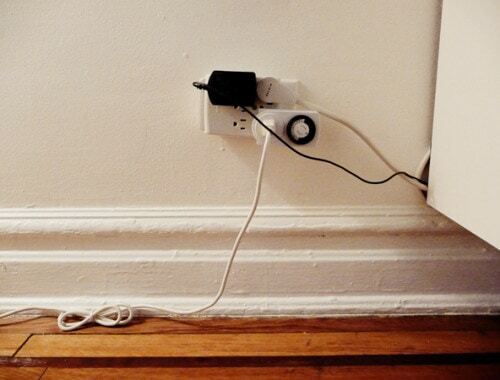 Clever + thrifty = love it! Those are fabulous! The black clickyknobs are the finishing touch, too! I love these apartment pieces that you are doing because I am having such a hard time even beginning to know what to do with my apartment, with its dark wood trim. luv those bulbs! such a simple and clean approach. you need not feel guilt, sometimes change is good. I will definitely be stealing this idea. Thanks in advance! It’s the perfect solution for a super cheap bathroom light. i always seem to get the rentals with sconces with little lampshades – the last apartment had black shades that were gold on the insides… yikes. i love that you were able to just paint the brass and get a totally different look. and thanks for the link for the lightbulbs! This is awesome! I adore improvements like this, you have a gift! It looks fantastic! They look great! I did the same thing to the brass ones in our apartment. I love those bulbs, haven’t seen them before so thanks for the link. Ewww…I had those on my ceiling fan when I moved into my home!!! Your is much better! Those silver tipped bulbs are awesome!! The sconce looks Fab-U-Lous!! Great transformation, even better that you could work it into a small budget. I have the same question as Alexis, did you have to scuff up or prime the brass before painting? I’d be afraid that the paint would just slide right off that finish. It’s true, landlords don’t care at all if you improve their apartment, just don’t harm it. When we moved out, we left all the shelves (there was more above the stove), which was quite generous considering it cost a lot, but it was literally custom fit for the space and would have left the most gigantic holes. And did I hear a peep out of my landlord? No, and I got my full deposit back. I’m sure she was glad she had a new selling (or renting, rather) feature. So, I am in total agreement about doing whatever you want to it while you live there, so long as it looks better when you move out, your landlord will love you for it. Great job, Anna! And Amen to doing small changes to make YOUR space more enjoyable! Keep up the great work! if i were the landlord i would ask you to toss those cheep glass covers and keep YOUR look. Lovely! These things are such a pox on apartments of a certain age. I bet lots of people follow your lead. oh my goodness! I have a couple of those in the house we just bought, and I hate them too! But, this is BRILLIANT!!!! And your landlord will probably be so happy that you are fixing up their place. I love the simplicity of these! It sort of reminds me of vintage milk glass. From the manufacturer’s website, the bulbs look like they’re completely covered in silver, but yours just have the silver ring. Did you do something to them to achieve this look? Alexis, Pam, Kara, & LaCL: No, I didn’t do anything to the sconces beforehand other than give them a good cleaning. I didn’t even take them off the wall, I just masked off the area around them (as well as the socket itself and the switch) and spray-painted them in place. I’m not sure what brand of spray paint I used (it was whatever was in my basement!) but probably Rust-Oleum. Gloss white, two coats. The bulbs are only 40W each, so the light is pretty soft even though the bulb is exposed. The top half of the bulb is COMPLETELY opaque, though, so all of the light comes out of the bottom half. If you have sconces with a downward bulb, the light will come out the top — just keep that in mind. Stephanie: My bulbs look exactly like the one on the website — the top half is solid silver, and the bottom half is clear. I think maybe what you’re seeing as a “ring” of silver is just silver showing through the interior of the bulb. If I took a photo from the same head-on perspective as the website, the bulbs would look identical. I LOVE your attitude about your place! 🙂 And of course your improvements are amazing-they’re lucky to have you as a tenant. Can’t wait to see the continual updates! Oh my goodness, these are the perfect mix of vintage and modern, just like everything else you have. those are perfect. absolutely perfect. a really neat solution (and improvement!) i’m just curious though, can you post a picture of the lights on? i’m curious to see what kind of light they cast. thanks. OMG you are such a fearless, little doer. You need an HGTV show. This is just too smart! You should write a book with all of these little things that make such a huge impact. Think of what an amazing resource it would be for apartment dwellers! This is COMPLETELY fabulous! I’ve been trying to figure out a modern solution to my cheap-o off-the-shelf-of-Menards pendant that came with our dining room. Bubye ugly, ugly frosted glass, hello gorgeous! Just beautiful. And you wonder why I ask WWAD. It’s amazing how much paint can do to transform the grossest looking things. What a great transformation! As for fixing rentals – I like your attitude. Before we bought our place we put a lot of $ fixing the rental we lived in and off course, the landlord loved us. But I know few people that have rented crappy apartments managed by very large companies that will try to make anything look like a “damage”, even normal wear and tear, just so they don’t have to return the deposit. It just depends on who you are renting from, I guess. You are BRILLIANT. Seriously. That is one of the best/smartest makeovers I’ve seen. Are you kidding me? those are the same light fixtures just painted and with very cool lightbulbs? unbelievable, but very sweet! Oh my god. They’ve turned out AMAZING. These bulbs are a perfect fit Anna. I used them before in my rentals in the bathroom to soften the brightness of six bulbs in a row. I gather you’re going for a modern black/white/silver theme in this apartment? I’m hoping there will be some yellowish accents you like to add to the neutral backdrop. i love it all. the spray/paint job and the bulb. damn, i wish we were allowed to make improvements to our rental. sadly the regulations are much more stricter in australia. the sconces look great But what I really like is your attitude about fixing up rentals despite what a lease may say. Unfortunately for me, I seem to have found one of those rare-breed landlords who puts tons of skill and care into his maintenance all with taste I’m not the biggest fan of. Yellow-creamy walls why must your paint job be so perfect? sigh. Yes, something had to be done…those were horrid! You’ve done a great job..they now look very stylish indeed. And seriously, this the BEST DIY I have seen anywhere on the web in a really long, long time. Great job. boops: I’m not a good enough photographer to take a photo of lights at night in a way that will accurately represent the light they give off when actually in the room. I’m sorry, I just don’t know how! Shilo: Wait…are you talking about the decayed-mayonnaise shade that’s in the before photo??? That paint color is an atrocity! I’m sorry…the walls are now white! I really like how that light fixture came out. That may be a solution for adding extra lighting on a super tight budget. The fixture does look like porcelain. Great job! I totally agree on the landlord thing. They just don’t ever care about their spaces. 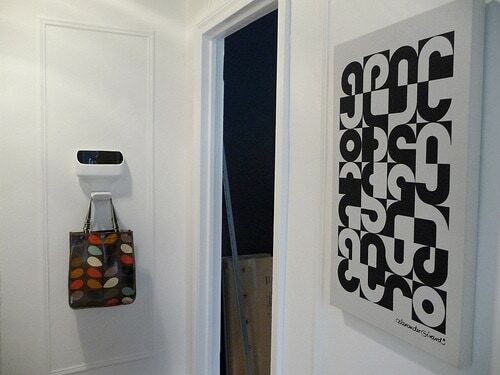 Great idea and inspiration to renters all around! They really do look like porcelain. We have similar sconces at our cottage that I was going to replace…maybe not? So So much better! Clean, simple, modern. I always love how you answer stupid people questions or comments before they say anything. I get not everyone has the same taste or style but never get why people have to leave ridiculous comments! Lighting looks amazing, you’re never going to want to leave your apartment once you get done! anna, the suspense is KILLING me! “after” photos pleeeaaase! kim: Um…that IS the after photo! genius! I never feel bad about making improvements in my place either. I have a horrible ceiling light in my bathroom, and I’m stuck with either re-wiring it, OR thinking of an alternative…. great inspiration! I love this! I am going to do the same thing to the hallway sconces in my rental this week. Thank you for the inspiration that your website always provides. Your posts have given me the courage to turn my rental into a space I like to call home. I never knew such light bulbs existed! Now, I’m destined to spend a small fortune at the 1000bulb store, ur, but thanks! oh, i know… i’m just waiting for the rest of photos of the apartment! i can’t wait to see what you’ve done! I cannot get over how much they really do look like porcelain! Amazing Anna, so simple and beautiful! Anna- No, I was talking about the interior paint in my own home! I have the same decayed mayonnaise shade but my landlord is a former contractor and housing inspector so he does everything with extreme care and perfection. Thus, I cannot get away with painting over it. Oh well, My husband and I are only living here a year. very nice, but Kathleen Hills did manage to turn those boring lampshades into something quirky (http://www.kathleenhills.co.uk/products/index.php?main_page=product_info&cPath=91&products_id=226). Love, love, love your blog! I like your attitude about “ask for forgiveness, not permission” when it comes to improving a rental. We own our house now, but if I was still renting I think I would just go ahead and do what you are doing, when it is so clear that it is an improvement. 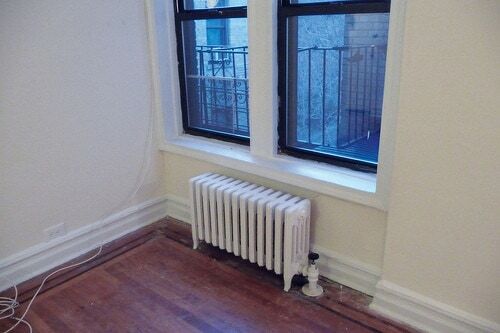 Is a landlord REALLY going to object to a carefully-applied coat of white paint? Our previous rental apartment was owned by a family that lived upstairs. They were fine with us painting (we even offered to let them approve the paint chips, but they assured us that they were confident that we would choose something nice!) We painted that WHOLE apartment, trim included, and it looked so much better. I would like to see what the light bulb looks like lite up. Cher: Please see my response to boops above. I don’t know how to photograph a lit bulb in a way that would be useful for reference, sorry! I was just curious to see how it would look when the entire room it lite up, not like a close up on the bulb. I guess I’ll see it in future posts….like the kind of shadow it casts in the room. I did exactly the same thing in my guest bathroom! I love the light the reflector bulbs create. I used white paint over a hideousssss brass long “vanity” light fixture in my bathroom, but now I wish I’d gotten some spray paint – it DOES look like porcelain! Wow! You are so clever. My boyfriend once had a landlord who REALLY cared about making his apartments into charming, unique spaces, and he did a fantastic job. It was the cheapest, yet by far the most beautiful, space that either one of us has ever lived in. It was gorgeous. Sadly though, while he was living there, his landlord sold his apartment to some other jerks. The reason? He was sick of tenants destroying the spaces he worked so hard to create. The tenant that lived there before Nick didn’t take out the garbage once in an entire year. Apparently, that’s not all that uncommon. Everyone I know who is a landlord has stories like this. Unfortunately, very few people care for a place the way they should. Having met so many landlords recently, I now understand why they don’t care about their apartments: because people just destroy them anyway. smart quick fixer upper…. I will have to steal this idea from you for a light fixture depression I need to deal with. I did almost the same thing in my own rental, except I painted the brass fixture to match the walls (gray) and used a low watt floodlight (25W) that is silver-edged and shoots light UP, just like a sconce should. I thought about doing the Gropius bulbs like you did but was concerned about how the light would come out. 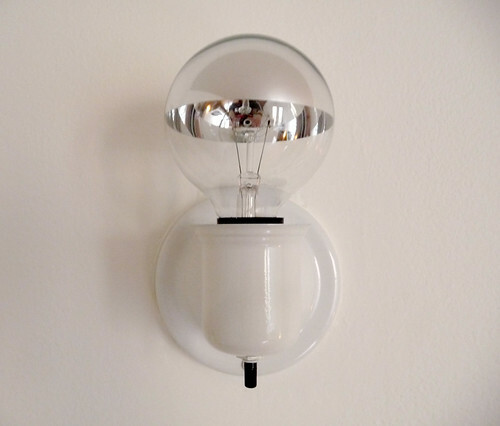 Rabbitfaces: I had no idea that Walter Gropius had any involvement in the design of this bulb! How interesting. At any rate, the light the comes out is quite pleasant, but you’re right — a sconce’s light should ordinarily be directed upward. However, these sconces are mounted really high up on the wall for some reason, so it actually works quite well having the light shoot downward in this case. What a genius fix! And remarkably simple too. They look fantastic. I am completely with you about the “ask the landlord” issue. 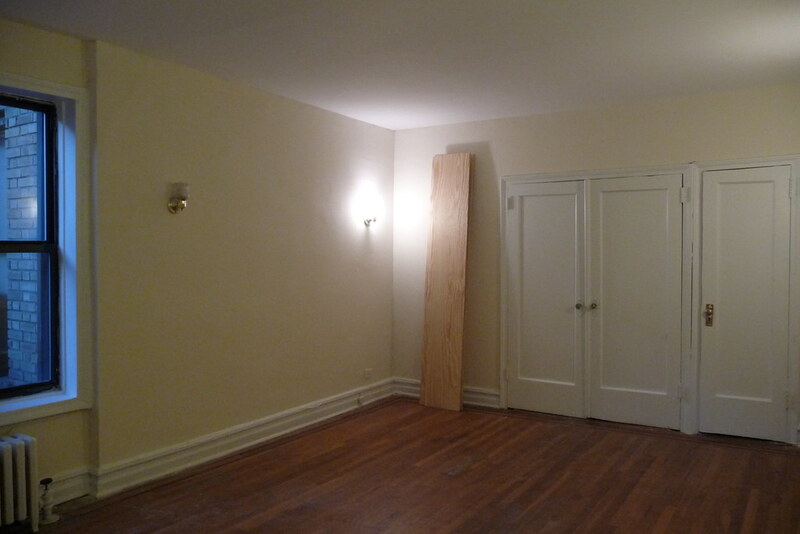 I’ve never met a landlord that cared how the apartment looked. You should see the monstrosity of a stove that I have. On second thought, you shouldn’t. You might get ill.
Gorgeous; understated and oh so Gropius. Nice solution. I will definitely keep this in mind. Never thought about spraypaint can look this nice on plastic! Looks great and amen, sista! Very nice! You’ve inspired me on how to improve the look of the ugly light fixture in our bathroom. White spray paint will do a world of good for ugly fake oak and brass! awesome! i’m always looking for super cheap ways to turn lame things into really great looking things! this is perfect inspiration for the hideous ceiling fan in our bedroom. thank you! 1) LOVE the idea about the sconces. That never occurred to me and I’ve been living with those exact nasty sconces you talk about for FOUR years. They drive me crazy every time I see them and yet they are STILL (except for one that I replaced with a slightly better version) here. Never knew those lightbulbs existed. 2) I always feel like a slug when I see what you’ve been up to. And this time, it’s renovating not one,but TWO homes! Your new abode looks lovely. Congrats! 3) The (neighbor) ‘hood misses you — first Neighborhood meeting on April 29th! Don’t miss it! I didnt exactly have any sconces in need of a makeover, or actually installed in my house at all. But my bf and I loved this idea so much, we decided “we need sconces”. Best $25 spent in the house yet. And since we were buying them new, we had the option of buying chrome colored fixtures that didnt even need spray pain. They look fabulous and we couldnt be happier. Thanks door sixteen! Home Depot has a similar version (square-ish on the bottom instead of round), but it costs over $14! I spraypainted mine dark gray and used an edison bulb. I’m going to do 4 more for other rooms in my house!